One thing that sets Gratz apart from his peers is his keen ability in minimizing his arrangements, yet magically never sending his listeners to the land of nod. That said, the pure piano musical interpretations of the age old carols are kept firmly intact though with a gracious and conservative Gratz twist here and there. Needless to say the combination of this artist and the timeless Christmas carols seem to be a match made in heaven. The festivities start with “I Saw Three Ships” whose almost gentle gallop brings to mind a sailing ship bobbing through the gentle waves as it shimmers across a winter ocean. The tempo is continued courtesy of the joyous “Carol Of The Bells” as well as the regal “We Three Kings”. 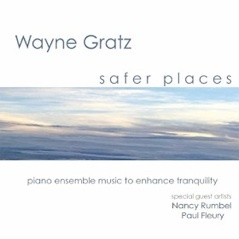 However, Gratz is wise in countering these more upbeat carols with reflective and melancholy moments. These arrive courtesy of the more spiritual carol themes such as “The First Noel”, “Silent Night” and “O Holy Night”. The latter has a wonderful swaying motion via the very soft rhythm arrangement of Wayne’s. Those of you who like a little twist on your Christmas carols may enjoy the less frequently covered carol “I Wander As I Wander”. 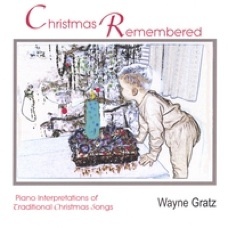 Gratz takes this one step further by closing out the album with his simple yet touching original composition and title track Christmas Remembered concluding this heartfelt and touching holiday affair. The only complaint would be the lack of bass on the project’s production, but perhaps this was intentional to prevent from distracting from the peaceful theme. Christmas time is a very special time of the year for many of us, reflecting back on the festive season with gladness and joy of our memories with our families. 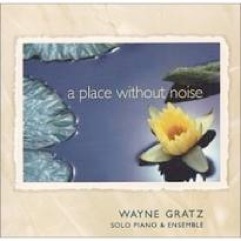 Gratz, from the personalized liner notes to the family cover photograph is in complete unity with his traditional pure piano interpretations; assisting us in remembering one of the reasons for the season.